Several days after the mortal battle against Link Joker which embroils the whole world, the world has returned to peace. But Kai Toshiki faces a surprising situation. Sendou Aichi, the hero who saved the world from the invasion of Link Joker, has suddenly disappeared. 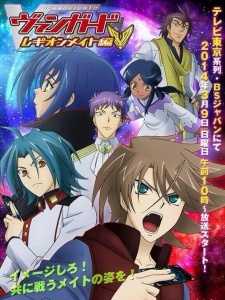 In addition, everyone's memory about Aichi is lost...Almost all hints have been lost, and Kai starts to search Aichi with "Blaster Blade" and the deck of Royal Paladin, the only existing hint and the proof of their bonds. Kai is approached by fighters who call themselves "Quatre Knights". The four---Gaillard, Neve, Ratie and Sarah---are fighters with world-class power in vanguard fights. They control mysterious power and urge Kai to give up searching Aichi. What is their purpose...!? And what is their relationship with Aichi...!? Kai, with the new power "Legion" in his hand, fights to take Aichi back. Now, the war has begun! Watch Cardfight!! Vanguard Legion Mate (S4) Episodes Online at Animegg.org. Cardfight!! Vanguard Legion Mate (S4) is available in High Definition only through Animegg.org. Choose an episode below and start watching Cardfight!! Vanguard Legion Mate (S4) in Subbed & Dubbed HD now.